Hi everyone! My name is Hershey and I am the sweet Puggle gal there on the left. That handsome Bichon next to me is my brother Baby. 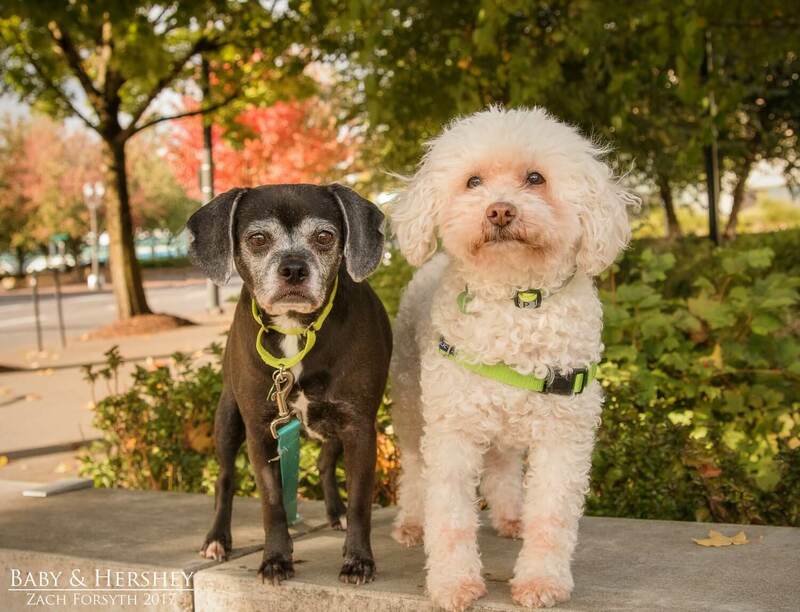 We are 10 year old love bugs awaiting a forever home full of cuddles and snuggles, and heck, even a nice walk or two would be oh so perfect! We are two calm and gentle souls who have known each other our entire tens years and can’t imagine being apart. Besides our daily walks, Baby does like to play sometimes. Balls are usually his toy of choice. My preference is chase games in the backyard. We both don’t mind hanging out with other mellow dogs and those dog savvy kitties are ok too! But we tend to really enjoy being around people the most. Roaming around by the beach or a river is our favorite past time, as we still like to be active. But at the end of the day, we just want to be around our favorite people over 10 who will love us as much as we love them. Will that be you? Fill out an application today, so we can meet! We come to you fixed, vaccinated, and micro-chipped and scheduled dental with an adoption fee of $350. Interested in fostering us? Email info@pixieproject.org today!